I love this rug! I will be moving and plan on order another one! 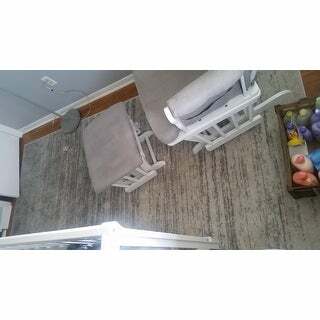 Safavieh Adirondack Vera Ombre Ivory / Silver Rug - 5'1" x 7'6"
I was looking at purchasing a similar more expensive rug but decided against it and it was the right decision. The Safavieh Adirondack rug is silver, grey, and ivory. Its a very nice rug. 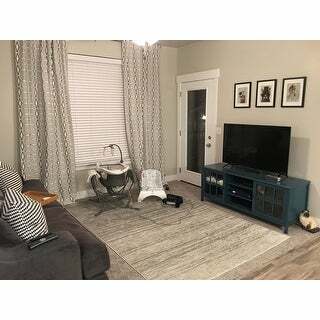 I loved the design of this rug and after looking for the perfect rug for 3 weeks I found this and put off purchasing it for a couple days until one day I finally just up and bought it. I was so relieved to have decided on one that I went back to look at it again and scrolled down to read reviews. I began to panic as I read many customers had gotten one that was darker than the photo Overstock had provided. 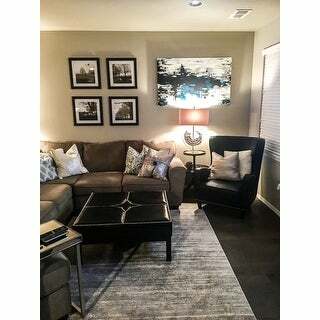 Finally I seen a photo provided by a customer that looked totally different from the rug I just purchased. I was so regretful. I reached out and even tried to cancel my purchase after a couple hours (just to have sort of a lousy experience with customer service) they were un able to return my rug and I recieved it about 2-3 days after. I opened the rug immediately and sighed with relief that it was EXACTLY as shown in the photo. The price is fantastic and the quality is just as shown and described. The rug is very low but is pictured and described as that. The color is a white to light gray/silver color ombre. 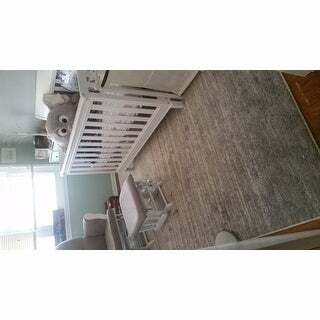 My photos may look darker and the nursery is rather small so I'm not able to photograph the rugs as well as they could be. But rest assured this is a really lovely rug. Beautiful rug but it is pretty thin. Will be perfect with a rug pad. Colors are as pictured. I love this rug! The colors are true to the picture. It goes nicely in our living room! I should have bought a size bigger, butter I am very happy with the quality of the the carpet! I love the colors of this rug. It is silver then fades into a cream color. Recently, I purchased another Safavieh area rug. That rug was thicker than this rug and soft under the feet. I expected the same quality from this rug. Unfortunately, it was much thinner. With a rug pad, it is fine. But not as cozy as my other rug. The rug is beautiful and the colors are as shown. I love this rug! It’s soft but not too thick. The ombré color variation adds a fun, modern style to my room. The 6’x9’ size is perfect for my couch and love seat... the front legs of each piece sit on the edge of the rug. It’s a great buy! Love the rug. Perfect color just as shown. Great rug for a really great price. The ombré effect is lovely and the ivory/grey coloring is perfect for our living room. Highly recommend! It is definitely as pictured. Nice colors, slow gradation from more ivory on one side to more grey on the other. Its neutral and modern. It's low pile, which I wanted. But low pile doesn't have to mean incredibly thin. It's basically like sitting on the floor. Even with a thick rug bad underneath, it's not an inviting rug to sit or lay on--a bummer because I bought it for my city family room. And it looks inexpensive. I can't speak to how it wears yet, but I'd be surprised if I had it more than 1 year. Absolutely love it!!!!!!! It's so much more beautiful in person and soft. It has a shiny look to it once the sun hits it! Gorgeous! I'm so glad we made the purchase. It compliments every piece of furniture we have in our eat in kitchen area sitting room. 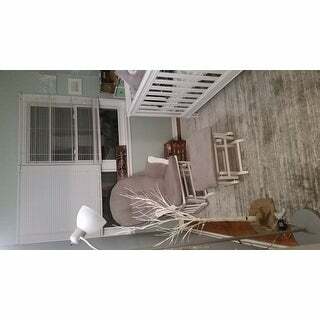 Love the rug, but it is ivory on one side and changes to a deep grey half-way. Wish it was more ivory, but I still like it. coloring is darker than I wanted. that would have been fine if the ombre was going in the right direction. Quality seems fine, but it the picture is deceiving so it looks like the ombre is going the other direction. I kept it only because I don't want to deal trying to get it shipped back. I will sell it on my own and get a different rug to replace it. Only this this time I won't buy it online. It looks just like the picture. Soft colors. Very thin carpet but then again it was very affordable. I really like it. I love the rug. It fits perfect in the room. Great quality and color! This rug is beautiful! It’s true to the colors in the picture. It took maybe a day to flatten out, and with furniture on top it does not slide. You can’t go wrong with the price. I would order it again! 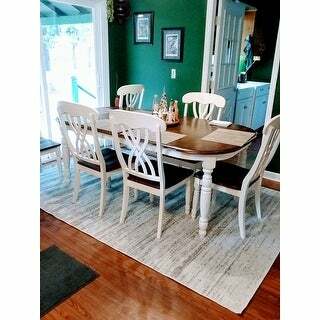 I was shocked over the quality of the rug and colors, however I wish the design was uniformed. It starts out with equal amount of ivory and grey then transitions to a darker grey less ivory going across. I love this rug! Bought for my dining room to reduce scratching on the floors. It’s soft and the colours are perfect. I really love this brand from overstock and bought bought other items too that i am equally happy with. 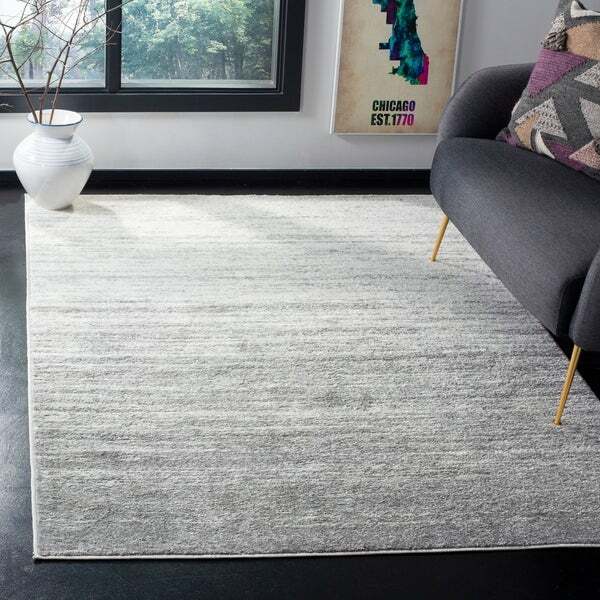 This rug is the perfect size for small apartment. The 6 by 9 defines the TV and living area. The gray and white color makes the room brighter and seems to look bigger. The 6 by 9 rug is easy to move around. The only downside may be that the light color may show dirt so I think a small rug in a darker color at the door may solve that problem. Beautiful and muted grays... not too busy. I love it. Carpet is prefect. Beautiful. this looks stunning in my dining room. 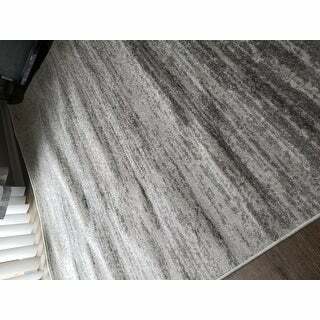 "Would you say it’s more ivory w silver streaks or more silver w ivory streaks. Pics vary so much it’s impossible to tell. 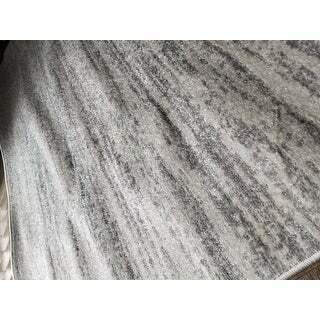 Thanks"
This rug has approximately 50% ivory and 50% silver that turn into a gradient / ombre effect from the edges. Please note that colors may vary due to dye lot variance during production. Definitely more silver it is beautiful! "Is this a shag rug?" This is not a shag rug, the pile height of this rug is 11mm. "Is this a good size for a Queen bed? I don’t need it to go up to the night stands!" This is too subjective. This rug is 6' x 9' in size. Please note sizes can vary up to a couple of inches. "Can l get it in a bigger size "
"I am not sure If the size will work in my space. What is the return policy if needed." Your photo shows 2 prices forr silver/white 9x12 ??? "Does this rug come in a bigger size? 9 x 12?" This comes in a similar option as 9 x 12 under item number 17337166. "Anyone experienced shedding from this rug?" It is normal for this rug to experience minimal shedding, however it should subside after a couple of weeks.